Plain lanyards at a cheap price that can be shipped anywhere in the UK for next day delivery. Our unbranded lanyards are carried in stock and come with a simple j hook for attaching plastic name card holders. Great choice of colours including pink, white, red, blue and black lanyards, they come in a 12mm width in a woven bootlace style, making them ideal as conference lanyards to wear around your neck. 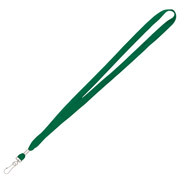 We can ship same day as payment, for speedy delivery to anywhere in the United Kingdom, so order your lanyards today!